LIVERMORE, California — Maritime transportation has emerged as one solution to the traffic gridlock that plagues coastal cities. But with urban passenger ferries operating in sensitive environments and tourist areas, hydrogen fuel cell-powered passenger ferries offer a quiet, zero-emission alternative to conventional diesel vessels. 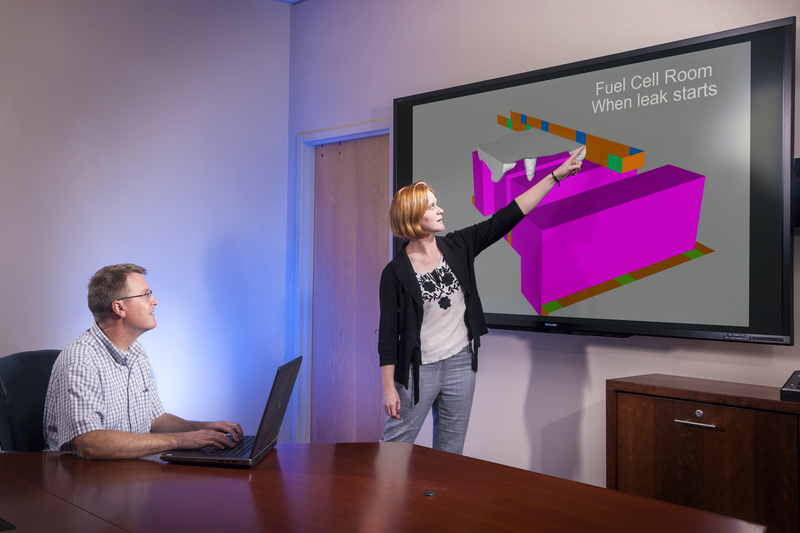 Sandia National Laboratories engineers Joe Pratt, left, and Myra Blaylock discuss recent modeling results that can inform accurate regulations for using hydrogen fuel on-board ships. (Photo by Randy Wong) Click on the thumbnail for a high-resolution image. 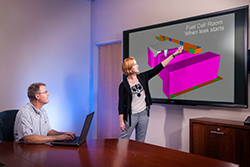 the technical evidence to support new safety codes for hydrogen fuel-cell vessels. The work is funded by the U.S. Department of Transportation’s Maritime Administration’s Maritime Environmental and Technical Assistance program. “The Maritime Administration sees immense potential in the use of hydrogen fuel cells to provide efficient, clean, domestically produced power for the maritime sector. The current effort to improve the economic viability using fuel cells in a commercial vessel will bring this vision one step closer to reality,” said John Quinn, Maritime Administration associate administrator for environment and compliance. The initial feasibility study focused on a 150-passenger ferry traveling at 35 knots per hour. Now, mechanical engineer and project lead Joe Pratt is asking whether it makes sense to design ferries that are faster or slower, larger or smaller. Sandia Labs started by plotting typical speeds and passenger capacities of about 600 passenger ferries in the U.S., and found that the ferry studied in the SF-BREEZE project was actually an outlier, being faster and having fewer passengers than most. The study seeks to make the trade-offs for the shipbuilding and ferry industries clear. The heavier and faster the vessel, the more power is required. To obtain more power, fuel cells — the most expensive part on a hydrogen-powered ferry — must be added, which drives up the cost, Pratt said. Sandia hopes to produce a half dozen ferry concepts to demonstrate which are most economical and which will make the most impact on protecting the environment, he said. Tom Escher is president of a San Francisco Bay operator, the Red and White Fleet, which was a partner in the initial study. He said he looks forward to moving ahead with new ferry designs.